This is a technique for recording intricate changes in facial expressions allowing to avoid hand animating the mimic og the CGI character by hand. The markers used for this task are small enough to be attached even to an eyelid. Motion capture cameras are precise enough to track small motion of tiny 3mm hemispheres, there may be tenths of them on a face. With our system, we may track whole body motion together with facial and finger markers in a small volume, too. The data can be then easily exported for retargeting and further tweaking to any of supported 3D animation system. Generally, depending on the purpose of the data, one may use Autodesk MotionBuilder, Softimage FaceRobot or DAZ studio for data processing. The markers are relatively small, which makes it possible to key them out with some effort from a video footage simply by using a faint blue or green coloured light placed close to the video camera lens (markers will appear as green or blue dots in the image, that makes it relatively easy to track and roto them out). This way one can record MoCap data and real video footage of actor's face at the same time, so later we can perhaps blend the real video footage to CGI model. It is possible to record audio and 4K video for reference simultaneously. Our MC stage is acoustically treated and we have a in-house fully equipped audio studio, RED One digital camera, keying backdrops and studio lights, too. 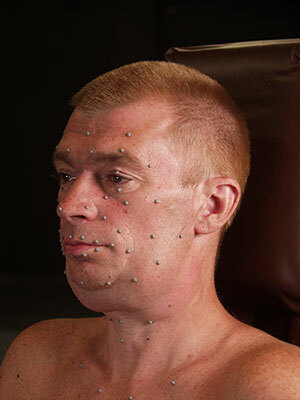 For best results, we recommend taking a 3D scan of the actor's face and use it as a reference for a modelling. This way, almost no retargeting occurs and the data can be retargeted almost directly!